Bomaderry Creek Regional Park offers a number of interesting bushwalks for the nature lover. 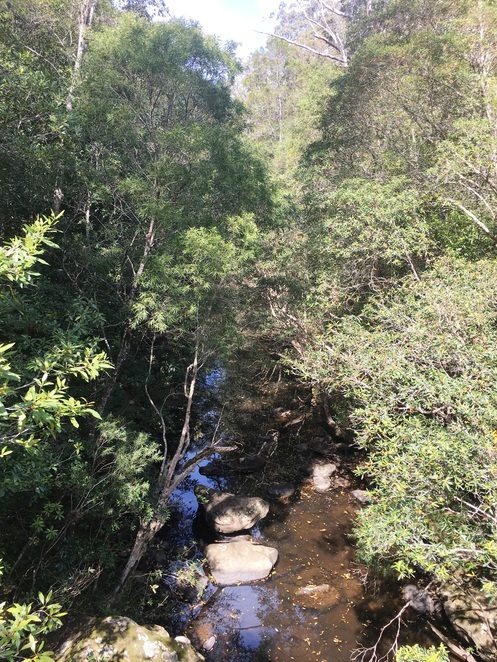 Located just off the Princes Highway at Bomaderry, this hidden oasis of Australian bushland is an unexpected and beautiful surprise featuring scenic walking tracks, a sandstone gorge and an abundance of natural beauty. The park is signposted on the Princes Highway at Narang Road. From the car park on Narang Road, take the pedestrian access track and you will come to the Narang Picnic Area. There are picnic shelters, BBQ's, toilets and a large, open grassed area. You will also notice a decorative mosaic, dedicated to the Aboriginal Children's Home located nearby from 1908 until 2009, which depicts the story of survival, connection and reconciliation of the local Aboriginal people. There are a variety of walks to sample in the park. 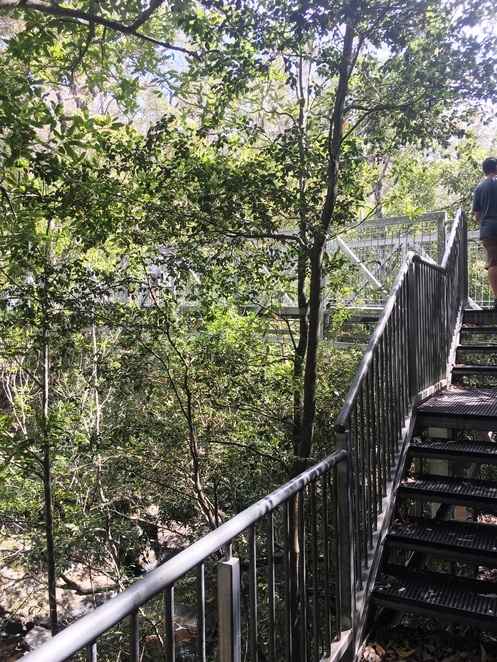 We completed the Weir to Mossy Gully (Eastern Walk), which is a 1.4km loop with a walking time of approximately one hour. This walk is classified as moderate and includes some steep rock steps. The Eastern and Western Walks are signposted just past the picnic area. It's a good idea to take a photo of the map before you leave the picnic area as it is not always obvious which track to take. 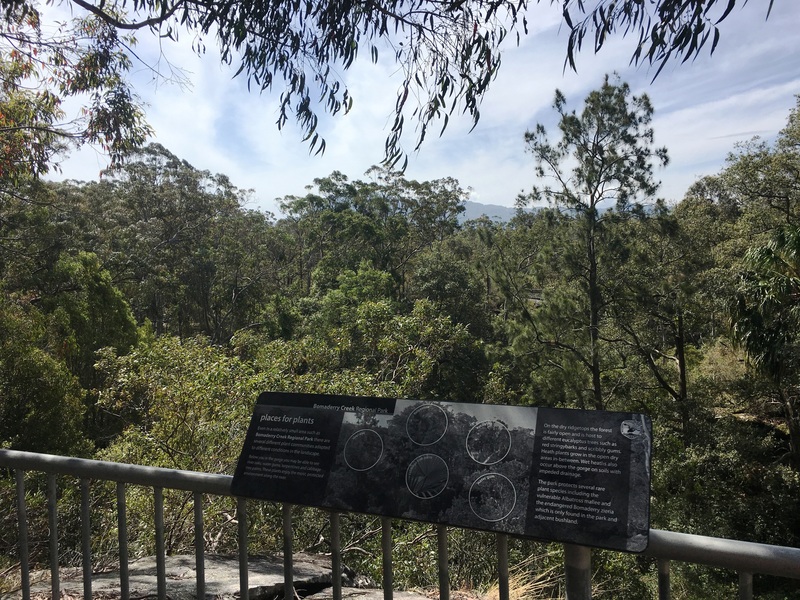 The first point of interest on the Eastern Walk is the lookout over the old Bomaderry Weir which dates from 1938. This weir provided the town with its first permanent water supply before it was superseded by a pipeline which brings water from the Shoalhaven River. Past the weir lookout, the walking track alternates between dirt and natural rock as it winds its way down to the gully. There is a wide variety of vegetation within the park, ranging from dry open eucalypt forest along the cliff tops to lush rainforest in the lower sections around the gully. The track features natural rock steps and the path is quite steep in some sections. There are many amazing sandstone overhangs along this walk and perhaps it was wishful thinking but we thought we could see some faint Aboriginal rock art in places. The vegetation becomes much greener as you descend down to Mossy Gully. At Mossy Gully we took the Bridge Crossing. From the top of the bridge, you can see down into the gorge. The types of vegetation you might see growing in the gorge includes River Oaks, Water Gums, Turpentines and Cabbage Tree Palms. There are a number of fenced lookouts throughout the park and benches where you can stop for a rest if required. There are also informational signs throughout the walk which explain significant features of the park and point out the various types of vegetation and flora. Some of the signs describe how the gorge was created by an ancient stream which carved through the layers of sandstone over millions of years. Interesting fact: The park protects several rare plant species including Albatross mallee and Bomaderry Zieria which is only found in the park and adjacent bushland. On the return loop, you will pass even more diverse landscapes such as damp cobblestone tracks and the other end of Bomaderry Creek. You will see enormous Spotted Gums and large rock shelters with sandstone overhangs. The track loops back around to take you to the base of the weir. In 1998 a small section of the weir was removed to create a "fishway" so that Australian bass and other fish could swim upstream when the water level permits. From here it is a short climb over the rocks and up the stairs back to the start of the track. Whilst the walks are signposted it is often difficult to know which track to take so it is a good idea to take a map (or photo of a map) with you. Dogs are permitted in the park but must be kept on their leash at all times. Bernies Lookout[ - a 30 minute walk from the Narang Picnic area. A detailed map of the various walks can be found here. The park is signposted on Narang Road. There is a small car park on Narang Road and from here it is pedestrian access only. Bomaderry Creek Regional Park is managed by NSW National Parks and Wildlife Service. For more information please click here. Great write up and photos of a delightful spot, thanks postcards.